September is prime time for shorebirds at Boundary Bay. 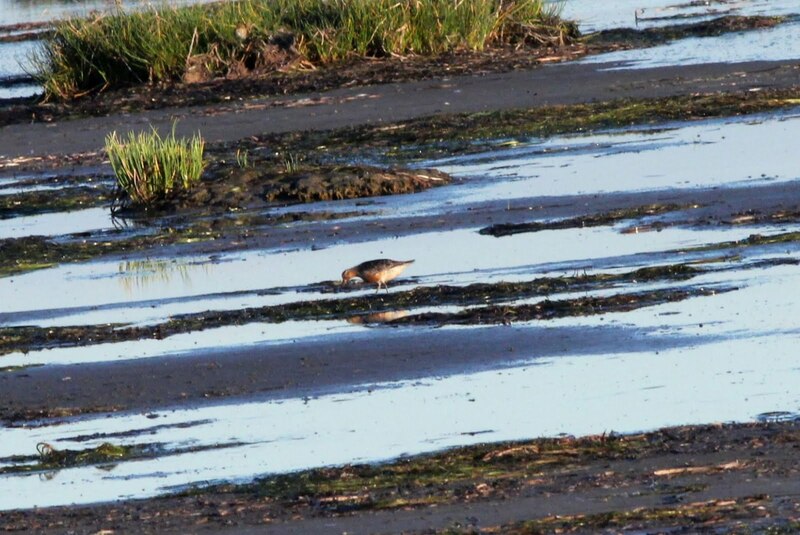 There had been many reports of Bar-tailed Godwits and other shorebirds on the dike at 96 St in late August. This was my first opportunity to get out and see for myself. I parked at 104 St and made the two Km walk west along the dike with all my gear. There were plenty of shorebirds but the "high" tide still left them over 100 meters away. The first bird I located was a Bar-tailed Godwit. Even in the scope it was difficult to see. It was facing away with its head tucked in most of the time. 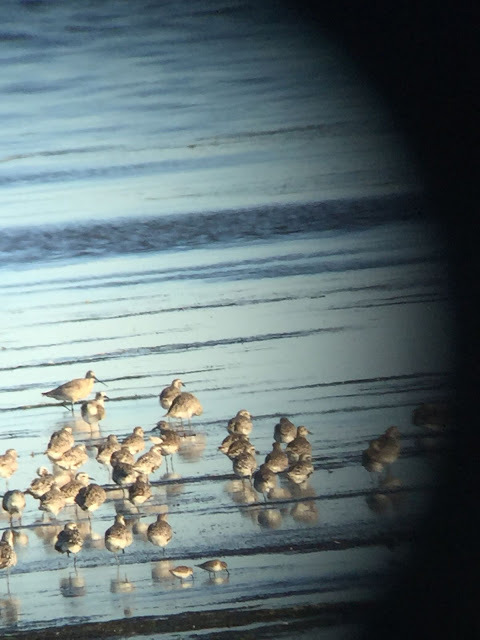 I did take a couple of digiscope photos with the IPhone which mostly proved that I did see a Godwit (Facing away at the rear). This shot shows the Godwit in more detail. It's at the back with the long beak. 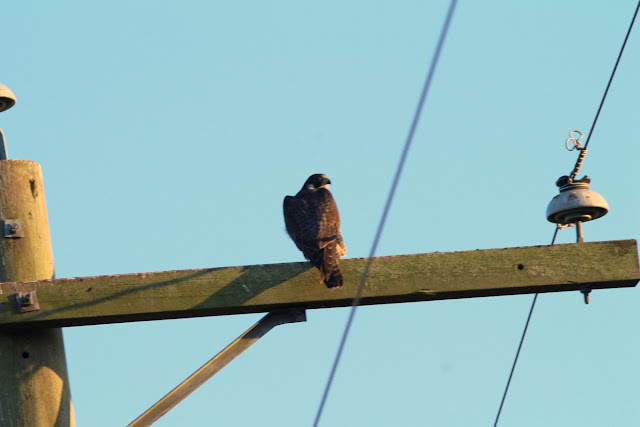 The ID is based on what the expert birders say, there's not enough detail in these photos to really ID the bird. There was a large gathering of local birders on site and it was fun to work with them to find the birds and ID them. Another bird that we saw was a Red Knot, a mid-sized shorebird that is common in Eastern North America. I had good scope views of it but did not take any photos. Here's a photo from September 3 2016, almost exactly a year before. We also saw Black and Ruddy Turnstones, the latter another eastern bird (see Jan 2017 post on this blog). Once again, no photos. 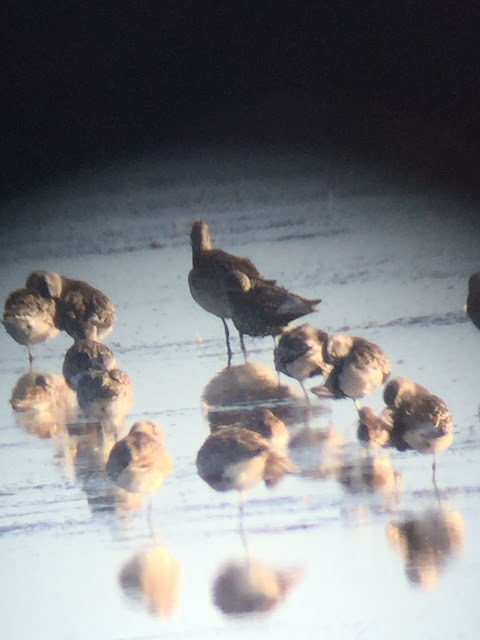 Another new bird for the year was a Short-billed Dowitcher. 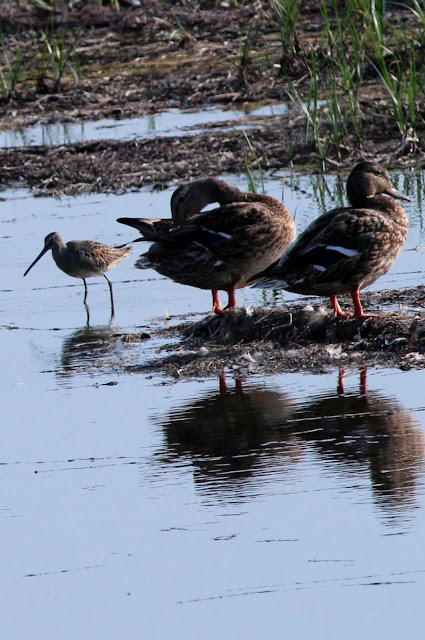 It takes a birding expert to positively ID a Short-billed vs a Long-billed of this species. We had an expert available and he identified it by the pattern on the tertial feathers. The Short-billed is also seen more commonly in salt water, the Long-billed prefers fresh water. These photos were actually taken on September 4th in pretty much the same location. 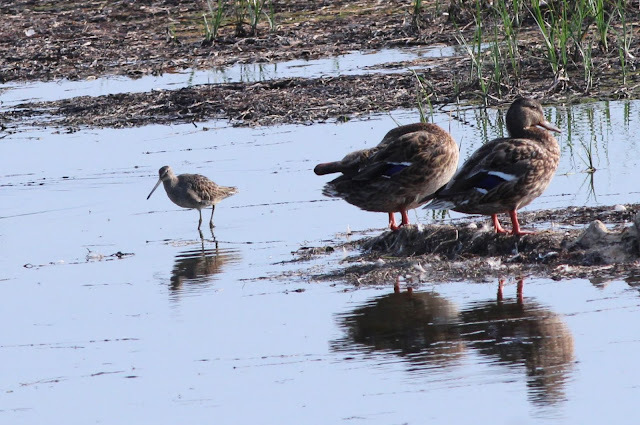 The Dowitcher is to the left of the ducks. On my drive back home, I spotted a falcon on a tree along 104 St. I took this shot out the car window.